View of “Siri Aurdal,” 2018. Left: Interview, 1968/2018. Right: Onda volante (Flying Wave), 2017. If it’s possible to choreograph materials and forms to give shape to social relationships within space, then that is what Norwegian artist Siri Aurdal accomplishes in “Continuum.” It could appear that this show is a reprisal of her 1969 exhibition “Surroundings” at Kunstnernes Hus Oslo, but upon entering Klas Anshelm’s Brancusi-inspired architecture, one realizes that this is an entirely new moment in an infinite work, and neither a reenactment of that earlier exhibition nor of her installation for the Nordic pavilion in the 2017 Venice Biennale. The artist constructs and combines modular elements from readily available and inexpensive industrial materials throughout the three bodies of work here. Each of the pieces engenders a freedom of movement within and around itself that makes the architecture a conduit for connectivity. A group of rectilinear Plexiglas forms with excised circles, waves, and curves, in fluorescent red, green, and pink for Interview, 1968/2018, and deep blue, fluorescent blue, and orange for Conversation, 2018, envelops the viewer. It is as if one were suspended within a mobile reflecting onto the building to create an explosive kaleidoscope of color and form. The figures change when the contrasting colors overlap, creating a new taxonomy of forms. 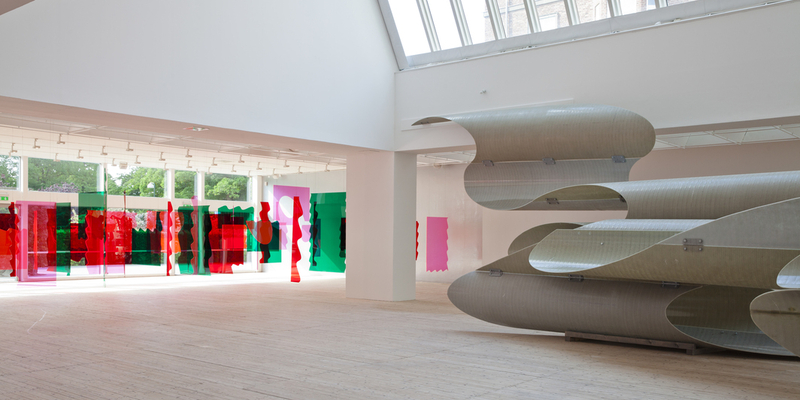 Onda volante (Flying Wave), 2017, is Aurdal’s work of sinuous, reinforced, fiberglass-coated, polyester shapes cut from tubes of a kind originally developed for the nascent Norwegian oil industry. They materialize as blank sections and extrusions, in contrast to their graffitied past, when the public was encouraged to scribe post-’68 epithets on their surfaces. The political was then writ large, but in this iteration, their ghostly quiet and scale are refracted to the present, rendering their silence as a collective protest.